The White House proposes to slash funding for State and the US Agency for International Development by 37 percent, and 14 percent from the Coast Guard and TSA budgets. The cuts will help pay for a wall estimated to cost more than $20 billion — which the president has insisted would be paid for by Mexico — and a proposed $54 billion defense spending increase. In 2016, out of a $4 trillion budget the United States spent $42 billion on foreign aid to support its friends and partners worldwide, which remains a critical national security tool. More than $5 billion annually goes to Israel and Egypt — $3.8 billion to Jerusalem and $1.5 billion to Cairo — while the rest is invested worldwide in building support for the United States and its diplomatic, security and economic interests. It is also is great branding for the United States — the world’s richest nation — when it brings a helping hand to those in need at a time when China has been spending lavishly on infrastructure and investment projects worldwide. The prospect of a nearly 40-percent cut prompted 120 top retired generals and admirals last month to oppose the administration’s proposal. They appreciate the importance of soft power as a necessary tool to accompany hard, military power. The cuts to the Coast Guard and TSA will be equally devastating. A 14-percent cut to the Coast Guard’s budget of $11 billion would be a debilitating hit for a service that is already struggling to make ends meet after two decades of chronically anemic funding. And as border defenses have been enhanced over the past dozen years, the Coast Guard has steadily gotten busier. Adm. Paul Zukunft, the Coast Guard commandant, has wisely noted that if a wall is built, those seeking entry to the United States would go either over, under or by sea to get around it. As the guardian and steward of America’s waters, the mission of the Coast Guard to interdict this traffic. 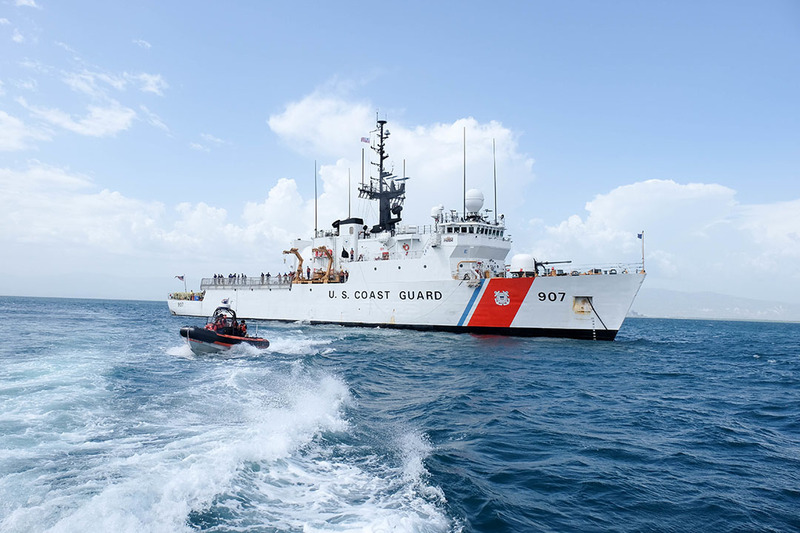 In the past five years alone, Coast Guard cutters and aircraft have seized some 630 tons of pure cocaine valued at $19 billion. At sea each year, the Coast Guard nabs more cocaine that the combined total of what is seized in America or at its borders. Last year, nearly 6,400 migrants were interdicted, and about 5,200 lives were saved in search and rescue operations. In addition, the Coast Guard annually inspects of tens of thousands of ships, shipping containers, ports, responds to oil and chemical spills and oversees of the nation’s vast array of aids to navigation vital to domestic and international trade. When it comes to return on investment, the nation is getting more than its money’s worth from the Coast Guard. Rather than talking about cutting Coast Guard funding, the administration should be planning to increase spending to better handle a rise in sea-borne traffic as the land border is tightened and underwrite a modernization of the service’s aging inland buoy tender fleet. The administration also wants to slash $500 million from TSA, which oversees security at the nation’s airports. These airports annually handle nearly 640 million passengers on a domestic air-transport system that manages some 27,000 flights daily that are integral to the nation’s economy. Yes, the Pentagon needs more money to improve readiness and modernize its conventional and nuclear forces. And there’s clearly a case to be made for better border security and wider immigration reform to improve safety and long-term economic competitiveness. But the assumption that building a wall and hiring more agents specifically to enhance security on America’s southern border and facilitate mass deportation, and merely raise defense spending, will make American safer is a mistake. National security depends on carefully assessing the threats to the nation — and its allies — and building a strategy that systematically addresses weaknesses relative to those threats. Does more have to be done to safeguard America’s southern border? Yes, but it’s a border that about 170,000 people crossed illegally last year. Are some illegal immigrants criminals deserving of deportation? Yes, but is the danger sufficient to justify the costs of a vastly enlarged force? Does the need to improve security on that border justify cuts to the security of an air-transport system that itself became a weapon on 9/11 and continues to be probed for weakness by terror groups? Is the need for immediate and massive military spending great enough to justify draconian cuts to other departments that plan a role in national security? Government’s job is to prudently balance risks rather than overreact to one threat, thereby facilitating even more dangerous unintended consequences. Fiscal prudence at a time of rising national debt is another key consideration, but the right way to address that challenge is through wider tax and entitlement reform rather than raiding funds from small but important government departments. As for foreign aid, it’s a long-term investment in America’s strategic interests. It can be transactional, and some lawmakers bristle that unfriendly nations also benefit from US largesse. Some spending takes generations to bear fruit, while more immediate funding may be vital to alleviating pressing concerns of hunger, disease and political instability. More than anything, foreign aid is spending on fostering stability that reduces the need for far more costly military operations. It is an investment in prevention, and as the old saying goes, an ounce of prevention is worth a pound of cure. And rest assured, if the United States cuts its foreign-aid spending — and pressures its allies to cut their international development investment to increase defense spending — Beijing will be more than happy to step in to fill the void. National security isn’t only about how much you spend, whether at the Pentagon, on walls or agents. Success depends on credible hard power, but also a range of diplomatic, economic and cultural tools that differentiate America’s unique ability to shape world events . This is why gutting State, Coast Guard and TSA will only weaken, not improve, the security of the nation and its allies.